The Cinema Room was designed to feel like a "First Class Aircraft Cabin"
Design Brief: No compromise large screen HD TV with hidden 7.1 Surround Sound - all to be located within an Attic space with an extremely awkward vaulted ceiling and no depth for in-ceiling speakers. Centralised control of eight sources that could be independently and concurrently sent to up to 8 rooms - to also be located in a hidden area in the Attic. ​The sources to consist of three SkyHD units, two AppleTVs, two Blu-ray DVD players and the CCTV security system. The house to be completely rewired for full HDMI high definition throughout, despite the fact that the house had been recently redecorated! The reason for this was that the Builder of this expensive property had put in a low end, multi-room system with fixed, in wall touch panels that only used co-axial aerial signals. 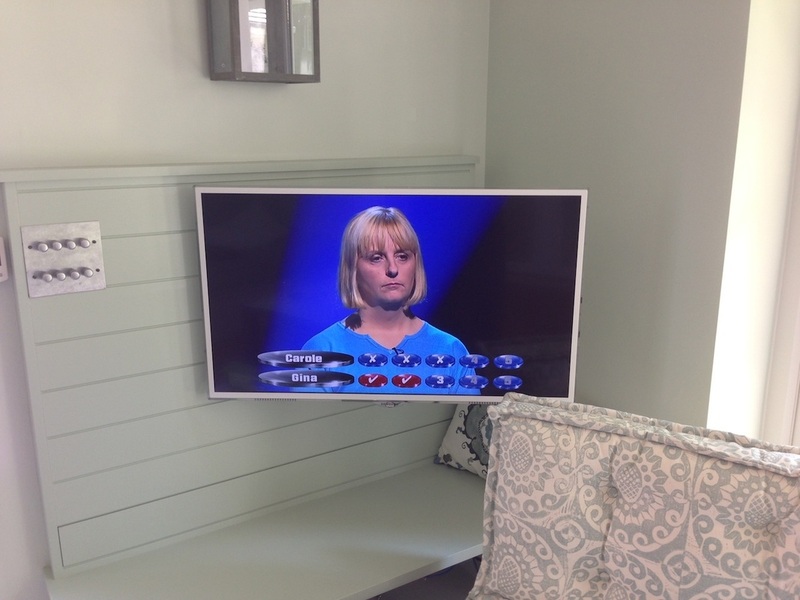 The Client wanted a HD future proof system with the ability to change volumes, channels and sources without having to get up to a clunky, fixed wall panel! Solution: A false wall was created in the Attic, behind which two Racks were installed with a 6x6 HDMI Matrix Switch at its heart. All front speakers were hidden behind acoustic cloth panels, the rears were small satellite speakers. The Subwoofer was a hidden, In Wall unit with a dedicated 250W Amplifier. The North West London property was rewired throughout with quad-core Cat6 cabling - for both a high degree of future proofing as well as redundancy and flexibility of configuration should the design requirements change. The Client's Interior Designer created a 'luxury jet' style cinema room with the front bezel of the TV hidden by a faux leather frame. 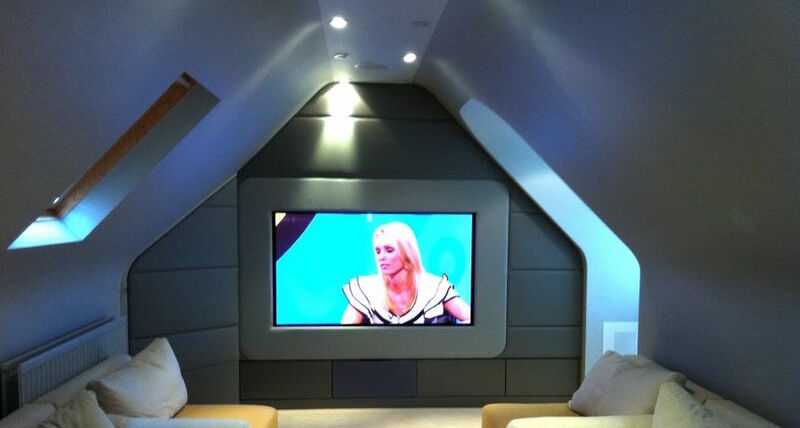 The Client has the flexibility of allocating specific SkyHD units to any combination of rooms. Similar flexibility is possible with the Blu-ray DVD players and AppleTVs. For instance children can only have access to their DVDs and suitable Movies downloaded onto their own dedicated AppleTV. Wow Factors: The look of the room as you walk in and the quality of the picture and sound within the £25,000 budget.